Lord Ayyappan had had His human sojourn as the son of the Raja (King) of Pandalam. At that time, Raja Rajasekhara ruled the kingdom of Pandalam. During one of his hunting expeditions, the Raja was puzzled to hear the wails of a child on the banks of the river Pamba. He moved in the direction of the voice to find a resplendent infant there. The beautiful baby with radiant face wore a bead ('mani') around his neck. Manikantan was born of Hari and Hara. The King, though pious, charitable, just, and God-fearing had no children. He accepted the child as God's gracious response to his fervent prayer for an heir to his throne. Manikantan was given proper education and training and he grew into a boy well versed in academic lore and martial arts of the time. Meanwhile the Rani (Queen) gave birth to a son. The King regarded Manikantan as his elder son. He decided to crown him as the Yuvaraja. The King's corrupt Minister had had a deep dislike for Manikantan. The Minister made the innocent Queen believe that adverse consequences would befall her if Manikantan was crowned Yuvaraja and that the kingdom actually belonged to her son. They conspired between them to get rid of Manikantan. They bribed the royal physician into becoming an accomplice of theirs. The Rani pretended to be afflicted with severe pain in the stomach, and the physician prescribed the milk of a tiger as the only cure for the ache. The King was in an agonizing fix. He knew that none could be deputed for a mission that was so potently suicidal. However, the youthful and valiant Manikantan stepped forth and volunteered to fetch the milk. Despite the worried protestations of his foster-father, he set out for the forests. Days later Manikantan entered the palace precincts riding a fierce tiger and followed by a pack of its cubs. The schemers were frightened into confessing their plot. They were convinced of His divine origins, and prayed to Him to be with them for their own salvation and for the safety of the kingdom. Filled with emotions of happiness, grief, fear, wonder and 'bhakthi' (devotion to God) and self-surrender, the king stood praying for the mercy and blessings of Manikantan. He repented he could not fully visualize the truth of the divine powers of the Lord and repeatedly requested Him to forgive him for behaving as if He were his son only. The Lord lovingly embraced the King who prayed to bless him by freeing from egos and the worldly life of birth and rebirth and grant 'moksha’ (salvation). Manikantan then enlightened the King on the path of attainment of 'moksha'. The Lord told the King that he could construct a temple at Sabarimala, north of the holy river Pamba and install His deity there. Ayyappan also explained how the Sabarimala pilgrimage shall be undertaken, emphasizing the importance of 'vrutham' and what the devotees can attain by His 'darshan'. The Lord further consoled the King saying that the devotees who held him and his descendants in 'bhakthi' shall happen to be devoted to Him as well. Manikantan then blessed the King and all others assembled there, and vanished. 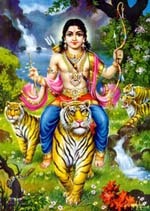 The King duly constructed the temple at Sabarimala, dedicated to Him. 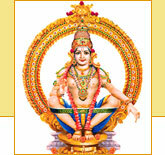 There are various lores connected with Lord Ayyappan. These relate to discovery of the child at Pampa, Manikantan's youthful days in the Pandalam palace, bestowing the power of hearing and speaking upon the deaf and dumb son of His teacher as Guru-dakshina, His friendship with Vavar (a Muslim), bringing the tiger's milk, accomplishing His divinely destined mission of annihilation of the demoness Mahishi, eliminating the forest-thug Udayanan, bestowing immortality on Sabari and blessing His foster-father with immortality. Manikantan was the incarnation of Lord Dharmasastha. Raja Rajasekhara was in his previous birth a rich and pious 'brahmin ' by name Vijayan who was a very strong believer and devotee of Lord Dharmasastha. Such was Vijayan's ' bhakthi' towards the Lord that He blessed the brahmin by granting his wish to be born as his son in his next birth when the Lord would offer him "moksha'. Pilgrimage to Sabarimalai begins from the 1st of Vrichikam, a Malayalam month coming in the middle of November (probably between 14-16). The most important day for Ayyappan is Makarasankranthi Day, which is the 1st of Makara (a month of the Malayalam calendar). This day will fall between January 14-16. Currently millions of devotees come from all parts of India to Sabarimala for a glimpse of Lord Ayyappan, having undertaken 41 days of Vratham (austerities). In 2005, at least 50 million devotees made the pilgrimage to Shabarimala (from 1st Vrichikam to the 1st Makaram). This is why Ayyappan is also known as Kaliyugavaradhana, since He can help us to attain Moksha in this difficult age of Kaliyuga, the Age of Hypocricy and Violence.